There are conflicting accounts of the early life of this saint. By one telling, Gertrude was orphaned at an early age and nothing is known of her family. Another report tells us that she was the child of a noble family at a time when it was often the custom to commit one young child of a large aristocratic family to the religious. In any case, the accounts agree that Gertrude was born on January 6, 1256, at or near Eisleben, Germany, and on the fact that she entered the Benedictine Convent of Helfta at the age of five. There, she came under the care and influence of the abbess, also named Gertrude, and her sister, Mechtilde. 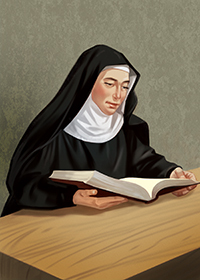 Under the guardianship of these two saints, Gertrude soon learned to speak and read Latin and developed a liking for the study of philosophy from the texts in that language. In about 1282, Gertrude experienced the first of a series of visions of Christ which would continue for the remainder of her life. While Gertrude had led a very scholarly life to this point, as a result of these early visions, she abandoned the study of philosophy and now began to concentrate all of her studies on Scripture. Also at this time, Gertrude began to write of her visions. Her humility led her to be remorseful for the life that she had led, selfishly studying subjects that, she felt, were not leading to her salvation. Gertrude’s writings spread throughout Europe where her reputation as a theologian developed and grew over the next several centuries. She was especially popular in Spain where St. Teresa of Avila chose Gertrude for her model. St. Francis de Sales was also greatly influenced by this saint’s writings. "Eternal Father, I offer You the most Precious Blood of Your Divine Son, Jesus Christ, in union with the Masses said throughout the world today, for all the Holy Souls in Purgatory, for sinners everywhere, for sinners in the Universal Church, those in my own home and within my family. Amen." Several miracles were attributed to Gertrude in her lifetime. In at least one case, a sister in her convent was afflicted by a strong temptation. While she fought off the lure of this failing, it continued to trouble her. Praying to Jesus, she asked that she be relieved of this suffering. In answer to her prayer, Jesus told her to ask Gertrude to pray for her. Once this happened, she was never bothered again. While St. Gertrude was never formally canonized, Pope Clement XII entered her name in the Roman Martyrology in 1677 and declared a universal feast day for her. This is now celebrated in the United States as an optional memorial on November 16. Gertrude's message today: While this saint was especially learned, it was not until she was about twenty-six that she chose the field and ministry that was to lead to sainthood. It is never too early or too late to answer God’s call. Are you asking for Jesus’ guidance in your life?